Crossfit Grenzgänger + House of Small Wonder-double shot. WORK-UP AN APPETITE AT CROSSFIT BEFORE GUZZLINg DOWN MIMOSAS AND JAPANESE TWISTED BRUNCH CLASSICS. START: Crossfit Grenzgänger, Reinhardtstraße 29, 10117 Berlin. 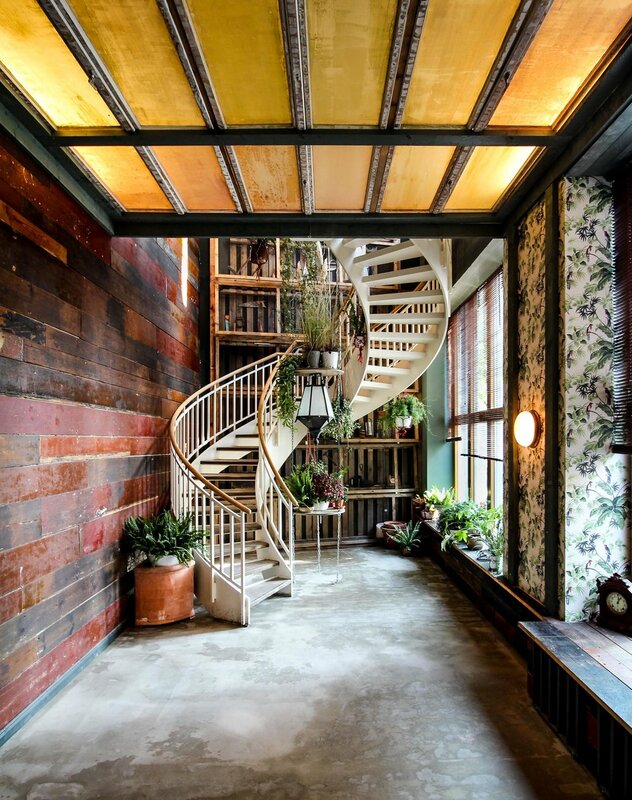 FINISH: House of Small Wonder, Johannisstraße 20, 10117 Berlin. U / S - BAHN: Oranienburger Tor. THE WORKOUT: WOD (Workout of the day) at 11am. Not for the faint-hearted but this is an incredible workout with highly experienced trainers and the box (a.k.a. gym space) is incredible. Buzz the entrance and make your way downstairs into the basement, where the floor opens out to an expansive space, complete with every Crossfit toy and pieces of kit you could possibly imagine; air-bikes, rowers, floor space, pull-up frame, rings, free weights, kettle-bells, bar-bells - the works! If its your first-time here, or even doing Crossfit d.w. the people are super friendly and will make you feel as welcome as can be. THE FOOD: Push through an unmarked door and fall into an Insta brunch dream. A winding white spiral staircase, leads up to a studio-style dining area which has an interesting mix of Japanese-Brooklyn vibes and a scene-ster vibe with a well-heeled crowd. Holy F the coffee is good but god it’s expensive, so we say skip the brew and go straight in for the hard-stuff. Traditional cocktails adorn the menu; the “pink” grapefruit mimosa is delicious and makes a nice change from the usual orange. Feast your eyes on the all-day brunch menu. The official brunch classics consist of six items, which are done really well (although not exactly “light” options). Homemade Biscuit Benedict offers up a homemade biscuit baked with ham, egg and wasabi hollandaise. Croque madame is oozy, cheesy, bechamel delight with scrambled eggs. Sweeter-tooth’s can opt for the “Croissant french toast” which is effectively two croissants made into french toast with maple syrup, cream and fruit. More lunch options are available and come with a Japanese twist. The Okinawan taco rice is vibrant and flavorful: spiced pork, veggies, Parmesan, and egg over rice (a Japanese take on tex-mex pork basically). Freshly made sandwiches are also available and you can choose from fillings like fig brie and apple (a surprising combo which goes SO well together! ), avocado and goat cheese, or mozzarella with tomato. Vegans, fear-not there are a few things on the menu for you too. The nigiri set are two rice balls complete with two vegetable sides and a miso soup. For a lighter snack, the zucchini noodle salad with vegan pesto is the one. This is place sets the standard for making classic brunch food a little bit more interesting in a cool and laid-back setting. It’s egg-cellent if we do say so. FYI: The place doesn’t take reservations so be prepared to wait at peak times. THE PRICE: Crossfit G: A drop-in class €15. Membership for six months with unlimited classes is €110 per month, or €90 for twelve months. House of Small Wonder brunch: Biscuit Benedict €12.5, Benedict Sundae (single) €5.5, (double) €9, Croque Madame €12, Croissant French Toast €10. Lunch: Taco rice €13, Onigiri set €8, Sandwich €8, Noodle salad €8. Drinks: flat white €4.5 (!! ), espresso €2, Iced tea €4, Mimosa €6.5, beer €4. BEST FOR: Work hard, play hard mentality.